4-Word Review: Chimp picks the hits. Stuck working in a television network’s mailroom, Steven (Kurt Russell) longs for his big-break into the programming department as his previous attempts to impress upper management (Harry Morgan, Joe Flynn) have all failed. Then his girlfriend Jennifer (Heather North) is put in charge of taking care of her neighbor’s chimp while they are away. To Steven’s surprise the chimp shows an uncanny ability to know which TV shows will be a success and which will flop. He decides to use the chimp’s talents and pretend that they are his own, which he hopes will finally let him climb up the corporate ladder. This film is a little bit different from all the other Disney flicks from that era in that there aren’t the slapstick hijinks or the patented car chase. The emphasis is instead on satire that for the most part hits the mark. It also has a protagonist that isn’t so squeaky clean either. Russell’s character is more than willing to lie and even cheat if he thinks it can help him move ahead and although he has a slight tinge of guilt about it’s never enough to get him to completely mend his ways, which helps to make him seem more human and the situation more believable. Joe Flynn is quite funny in support. He was a comic character actor who had a great ability to play both exasperated authority types as well as meek subordinates and here he does both. He also has an amusing scene with Wally Cox on top of a ledge of a high rise building and I couldn’t help but think about the irony as I watched these two carry out the scene that only three years after this film’s release these otherwise healthy looking middle-aged men would both be dead. There’s also the novelty of seeing two alumni from ‘I Dream of Jeannie’ appear here with Hayden Rorke, who played Dr. Bellows on the TV-show and a TV exec here, and Bill Daily who ironically plays an airplane navigator, which he also later did on ‘The Bob Newhart Show’. The film’s funniest moment though is actually just a throwaway bit where a news reporter, played by Jack Smith, goes out and gets the opinions of people on the street about their take on the rumors that a chimp is picking the TV shows that they watch. He interviews one woman (Iris Adrian) who at first scoffs at the notion, but then thinks about how all of her favorite shows get cancelled and how so many stupid ones gets put on the air and then comes to the conclusion that a monkey running the network makes perfect sense. It brought to mind a memoir written by legendary screenwriter William Goldman detailing in his opinion how studio execs really don’t have any clue what film will become a hits, which becomes the film’s best joke as in all honesty you’d have just as much luck with a chimp picking the stuff as you would a person. 4-Word Review: Killer taunts newspaper reporter. Feeling burned out from years of reporting on the local crime scene journalist Malcolm (Kurt Russell) has promised his girlfriend Christine (Mariel Hemingway) that he wants to get out of the business and move away to somewhere quiet and less hectic. Just as he’s ready to quit he gets a call from Alan Delour (Richard Jordan) the man who has been committing the recent killings that Malcolm has been covering in his newspaper. Malcolm sees this as a goldmine of information and thus delays his resignation. The two then begin a weird cat-and-mouse relationship until Malcolm becomes more of the story than the killer. The movie starts out promisingly with a realistic look of the inner-workings of a big city newspaper. The film was shot during the overnight hours in the actual newsroom of The Miami Herald with Herald reporters used both as extras and consultants. Richard Masur makes for the perfect composite of a newsroom editor and I liked how the film shows the behind-the-scenes politics and the thin line reporters’ tow between reporting the news and becoming it. I loved the on-location shooting done throughout Florida that helps bring out the varied topography of the state. Masur’s view out of his office window is dazzling and the climatic chase through the Everglades is exciting as is the speedboat ride in the swamps. The shot of a distant storm on the edge of an open field nicely juxtaposes the tension and dark story elements. 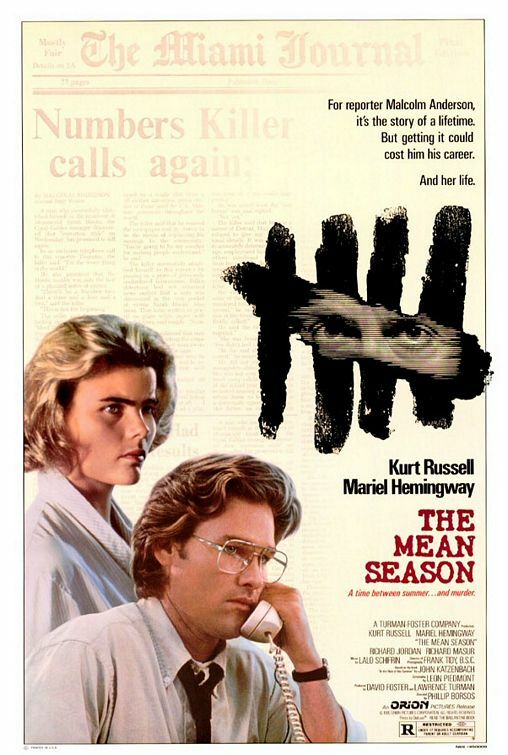 The phrase Mean Season is actually a term used to describe a South Florida summer and gets mentioned in an early scene by a radio announcer as he is giving the weather report. Russell is solid in the lead and it’s great and a bit unusual to see a protagonist who is not playing the nerd type wearing glasses. The segment where he jumps across a bridge as it’s going up and then watching him tumble down when he reaches the other side is well shot. Jordan makes for a good villain that manages to convey both a sinister side and a vulnerable one. Richard Bradford also deserves mention playing a tough cop that is at times quite abrasive, but also sensitive particularly in a couple of scenes where he comes into contact with scared children, which are two of the best moments in the movie. The provocative concept has potential, but the film doesn’t go far enough with it. Instead of becoming this searing expose on journalism and the media it timidly steps back and turns into just another run-of-the-mill, by-the-numbers-thriller that becomes predictable, formulaic, and just plain boring during the second half and helps make this movie a big letdown. 4-Word Review: Sniper in the tower. 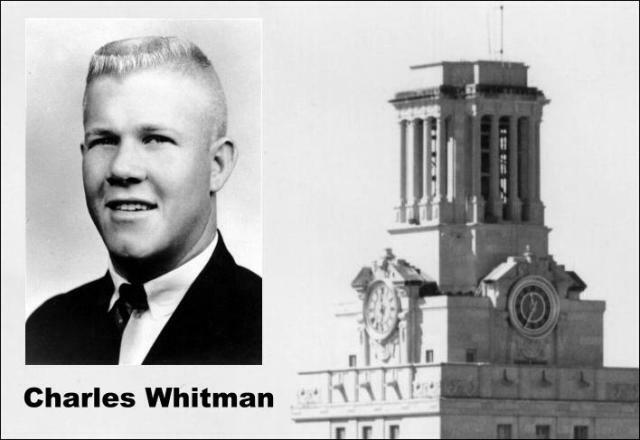 This made-for-TV movie chronicles the events of August 1, 1966 when 25-year-old ex-Marine Charles Whitman (Kurt Russell) climbed to the top of the University of Texas campus tower and shot and killed 16 people while wounding a total of 32. The story intercuts between scenes showing Whitman preparing for the shooting while also looking at the private life of Officer Ramiro Martinez (Richard Yniguez) who eventually climbed up the tower to stop Whitman’s slaughter. For the most part the film is taut and methodical and well above average for a TV film although Gilbert Roland’s voice over narration was unnecessary and a bit cheesy. The only time there is any music is during the scenes showing Whitman killing his mother and wife with a knife, which gets a bit too overly dramatic, but otherwise it comes off almost like a documentary making the viewer feel that they are right there as it is happening. It was filmed at the Louisiana State Capitol, which looks a bit different than the actual clock tower, but still similar enough that it works. Russell who had just come off starring in a long line of Disney films is perfect in the role and even closely resembles the real Whitman. The fact that he has very few lines of dialogue is an asset and helps to make the character more foreboding and threatening. The rest of the all-star cast does pretty well although Forsythe’s character seems added simply to promote the gun control issue. Clifton James appearance as one of the police sergeants was misguided because he had already done a comic caricature of a redneck sheriff in the James Bond film Live and Let Die, so it was hard to take him seriously here and it took me out of the movie a bit because it kept reminding me of that one as well as his goofy policeman role in Bank Shot. The film also takes liberties with the actual events in strange ways that makes no sense. For instance in the film when Whitman comes upon the tower receptionist he simply guides her to the elevator and tells her to leave, but in real-life he knocked her to the ground and split her head open before later shooting her. Also, in the film the first victim that he hits from the tower is a male, but in the actual incident it was an 18-year-old female who was eight months pregnant. The story also erroneously credits Martinez with the one who killed Whitman when the later autopsy found that all four shots that Martinez fired at Whitman missed him and it was actually the two shots fired by Officer Houston McCoy who stepped in after Martinez had emptied his rounds that proved to be the lethal hit. In fact Officer McCoy’s name gets changed here and is listed as C.J. Foss and is played by actor Paul Carr as a minor throwaway part that is barely seen at all. Both McCoy and Martinez sued the producers for the inaccuracies. Martinez was upset because his wife was portrayed as being pregnant and Hispanic when in reality she had been German-American. The sidelight drama of some marital discord between the two was also apparently untrue and should’ve been left out completely as it adds nothing and bogs the thing down as a needless Hollywood-like soap opera. 4-Word Review: Don’t trust car salesmen. 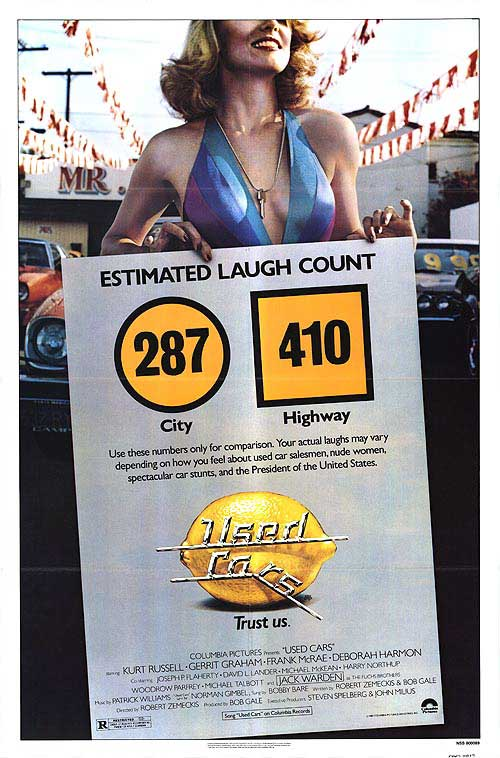 Crazy, zany comedy written and directed by Robert Zemeckis dealing with twin brothers Roy and Luke Fuchs (Jack Warden) who run competing used car dealerships that sit right across the street from each other. The film examines the various shenanigans that each pulls on the other in order to give their business the edge. Steven Spielberg was the executive producer and the result is taking a rather flimsy plot with an ordinary setting and propelling it to gargantuan proportions with lots of stunts, twists, and action. It teeters precariously to falling over-the-edge with too much of it getting silly and exaggerated, but somehow it manages to save itself by being consistently funny and clever. Some of the segments really had me laughing even after repeat viewings. My favorite is when they jam the TV signals and then break into a live broadcast with one of their off-the-wall commercials. However, from a purely visual perspective the climax, which features over 250 used cars speeding across the desert in order to get to the dealership before an important deadline is impressive. Although the humor does manage to hit-the-mark the rest of it is run-of-the-mill. The characters are too dishonest, lowbrow, and scheming, which makes it hard to warm up to any of them. This is especially true with the Rudy Russo (Kurt Russell) character as the film goes overboard in creating the obnoxious salesman stereotype. The suits he wears are loud even from a comedy perspective and only a complete moron would be seen in public wearing them. Russell is also too young and too otherwise hip to be caught up in with the down-on-his-luck salesman caricatures and the part would have been better suited for an actor who was middle-aged. Bringing in Barbara Jane (Deborah Harmon) as his love interest is too forced and their romantic interlude bogs down the momentum. Warden shines as always and this could be considered his career pinnacle. He plays two very different types of characters and as usual pulls it off in effortless fashion. He shows great energy in a fight sequence as well as in the end while standing in the back of a pickup and dueling with Rudy. Gerrit Graham comes off as the most likable of the bunch and the running joke involving his superstitious nature works. His dog has to rate as one of the better animal performers and does some really funny tricks. The cars look like they are genuinely of the used variety and it is great seeing all the old model types that they no longer make. My only real quibble involves the climatic sequence which although fun seemed implausible especially when taken into consideration that the hundreds of cars seen careening across the desert were driven by student drivers and yet none of them broke down, or had an accident, which seemed highly unlikely.